& Spa. Worth mentioning are the large spaces offered indoor and outdoor, however in total, the Castle hosts only 16 rooms and guarantees a attentive service to each guest. Located in the coast of Taormina on the east coast of Sicily, the Castello di San Marco Charming Hotel & Spa enjoys the wonderful and charming view of Mount Etna. The hotel is by the sea and just 60 m from the private beach. The port of Messina is located at about 44 km while the nearest airport is Catania Fontanarossa, which is at about 40 km. 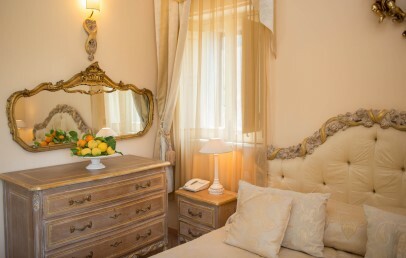 Nestled in a beautiful park overlooking the sea, the Castello di San Marco Charming Hotel & Spa was created from a historic mansion dating back to the seventeenth century, which retains the charm of the old castle welcoming guests in an enchanted atmosphere. Interiors with beautiful chandeliers, spacious lounges and lava rock arches; exteriors with ancient towers, large garden, surrounding walls... an environment of great charm that will satisfy the most demanding customer expectations. The 30 rooms and suites of the Castello di San Marco Charming Hotel & Spa, immersed in the park among the buildings around the Mansion. 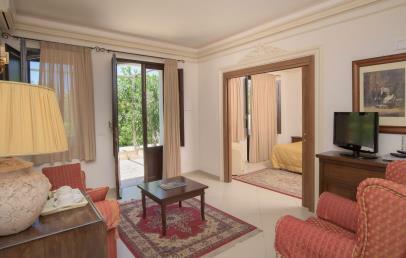 The Classic rooms include a living room, a bedroom, a bedroom for children and a small private garden. The Junior Suite, the Family Junior Suite, the Suite, the Suite De Luxe and the Grand Suite Cavaliere Costarelli are all individual for their uniqueness and elegance, have wide spaces and are elegant and refined. The hotel's private beach is located about 60 meters away. From mid-June to mid-September, it is equipped with umbrellas and sun beds, not included in the room rate. In addition to the private beach, guests can enjoy the nearby spacious shoreline (not equipped). Aquae Leonis – Salus per Aquam – offers several health and beauty treatments to regenerate body and mind. Personalized treatments, massages, oriental and holistic therapies, facials and body treatments, body scrubs and mud wraps, thermal paths... all this with a personal goal, to improve you well-being. The famous restaurant Mastri Flavetta embraces a culinary style typical of Mediterranean cuisine, with organic vegetables grown in the territory of the feud San Marco. On Saturdays evening, a romantic dinner by candlelight pampers guests of Castello di San Marco Charming Hotel & Spa, in a welcoming, romantic and refined atmosphere. In spare moments, guests can relax in the pool, enjoy a massage performed by experienced hands under the shadow of the elegant gazebo, or play tennis in the illuminated court. 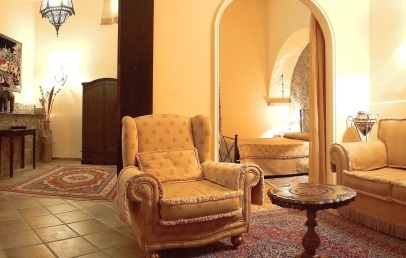 The old winery is now used as a wine bar where you can taste the best wines of Sicilian tradition in an environment that has preserved the charm of the old Ways of Wine, of which the Castello di San Marco Charming Hotel & Spa was a fundamental issue. 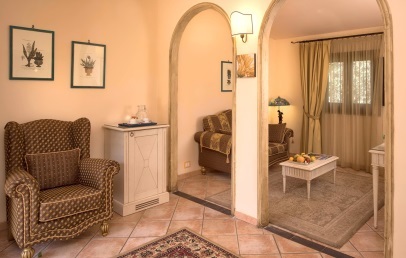 Spacious and bright suites all different from each other, located in the park of the Hotel and characterized by an antique style typical of the entire structure. They consist of a bedroom and a living room. 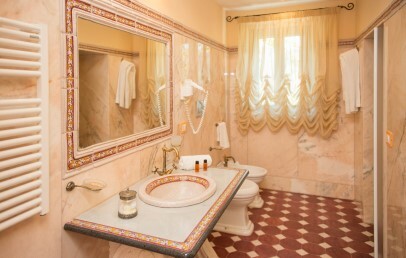 The bathroom, furnished in marble, has a shower and hairdryer. 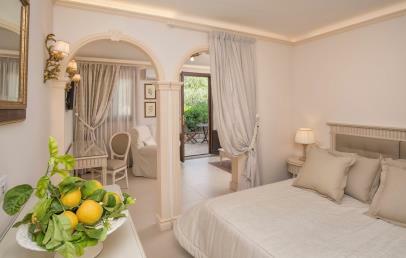 The Junior Suites offer the convenience of a private garden. 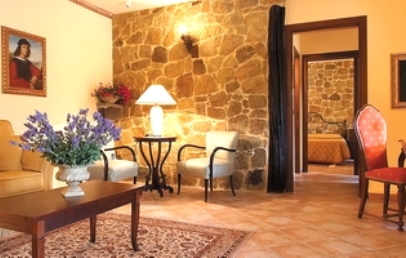 Romantic Suites all different from each other, located in the park of the Hotel and characterized by an antique style typical of the entire structure. They are located in buildings of the 1689 and surrounded by the park. They have a double bedroom, a living corner and a large bathroom with shower and hairdryer. Suites overlook a lovely balcony or terrace vith garden view. 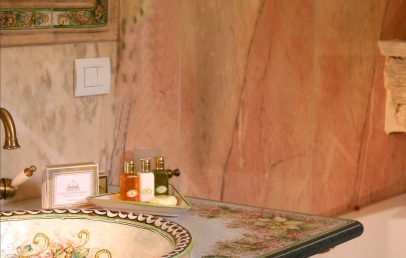 The Suite De Luxe are mini apartment, elegant, luxurious and with a special care for details. They are divided in a double bedroom, living room and bathroom with shower or whirlpool and hairdryer. 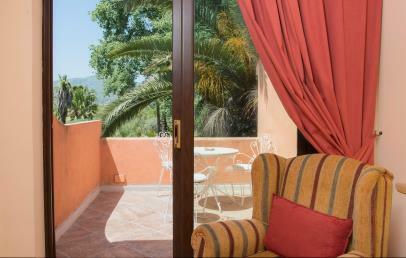 The Suite De Luxe overlooks a nice balcony with a lovely view over the Etna and the pool. 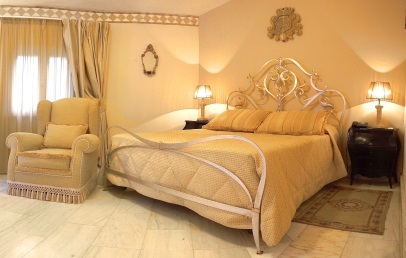 The largest and most prestigious Suite of the hotel subdivided into three rooms. 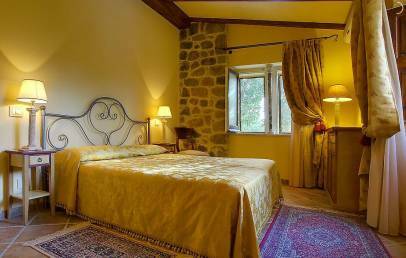 The living room, reading room with small terrace and spacious bedroom with beautiful view over the Mount Etna and the vigorous garden. The bathroom has a double shower with high pressure water. 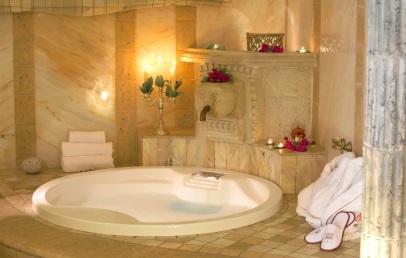 Exclusively for Charming customers: 10% reduction voucher for the SPA Aquae Leonis or for the Restaurant Mastri Flavetta!